While in the United States, I had to travel from San Francisco to Los Angeles for a work event. Deciding to try something new, I booked a seat on the Coast Starlight, the Seattle to Los Angeles train operated by Amtrak. While I’m an aviation buff at heart, travel by train also interests me. 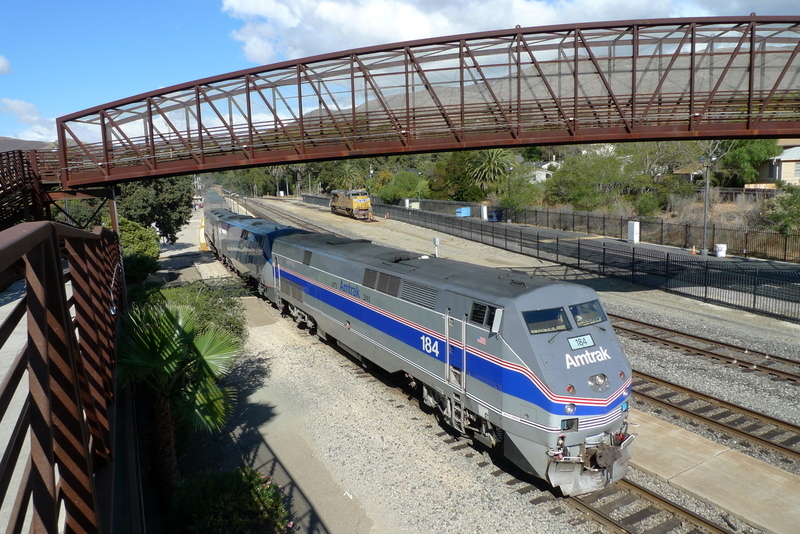 I have used Amtrak several times on the Capital Corridor route, which runs from Sacramento to San Jose, and when I was very young my family traveled from Denver to Salt Lake City on the California Zephyr service. That’s the extent of my travel by train in the United States and I’ve longed for years to try Amtrak for a long-distance trip. 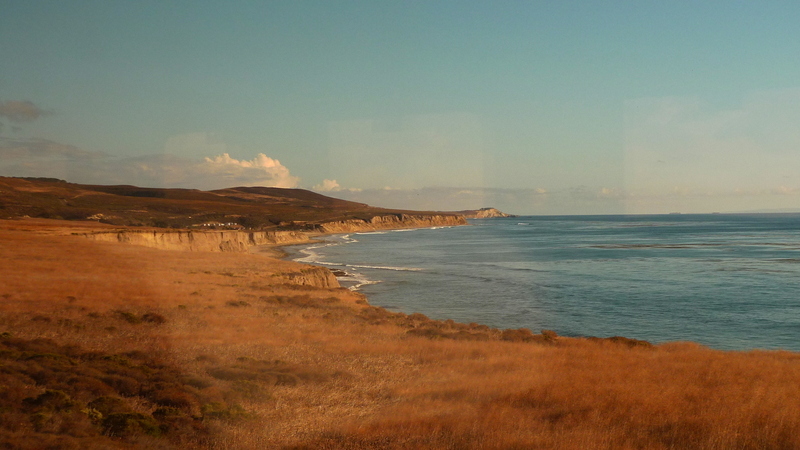 The Amtrak website was easy to use and I was able to book San Francisco to Santa Barbara one-way for only $50. The only downside was that the journey would take more than nine hours, door-to-door. Compare that to my experience on Taiwan’s high speed rail last year, covering a similar length journey in less than two hours! The first segment of my Amtrak trip started with a ride on San Francisco’s MUNI rail system, from the Church Street station to Embarcadero. At about 6:30 am, the train was not too crowded and there was room for me and my roll-aboard bag. 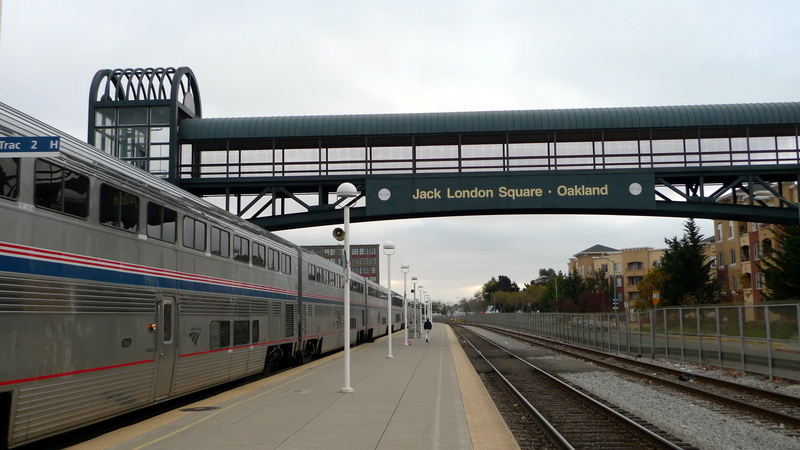 Amtrak doesn’t have a rail station in San Francisco, operating all its trains from the Emeryville and Oakland stations on the east side of the bay. 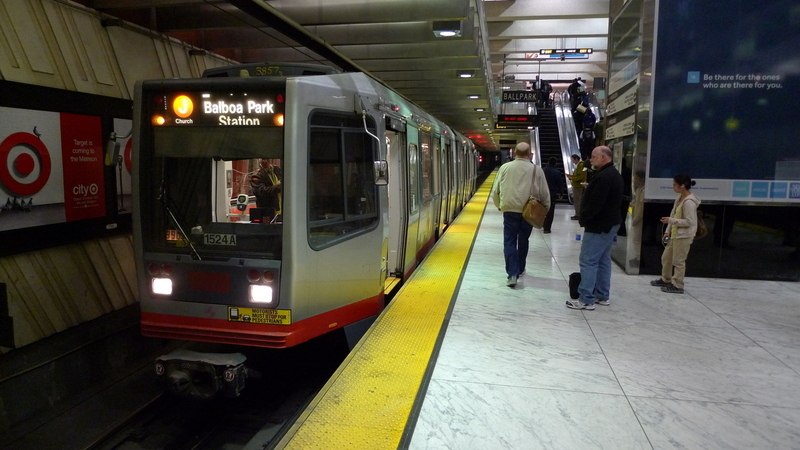 They do provide bus service from several points in San Francisco, though, connecting to those stations. 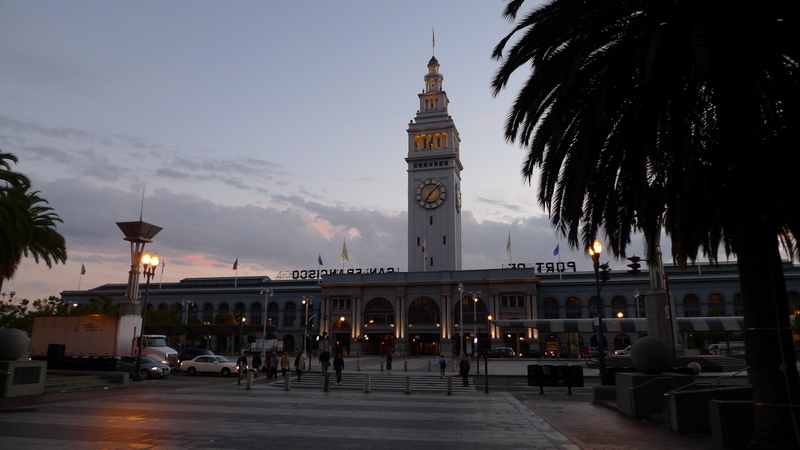 Above, the historic Ferry Building at the foot of Market Street. The Amtrak website identified the one San Francisco bus stop that allowed for checked baggage as being at the Ferry Building. 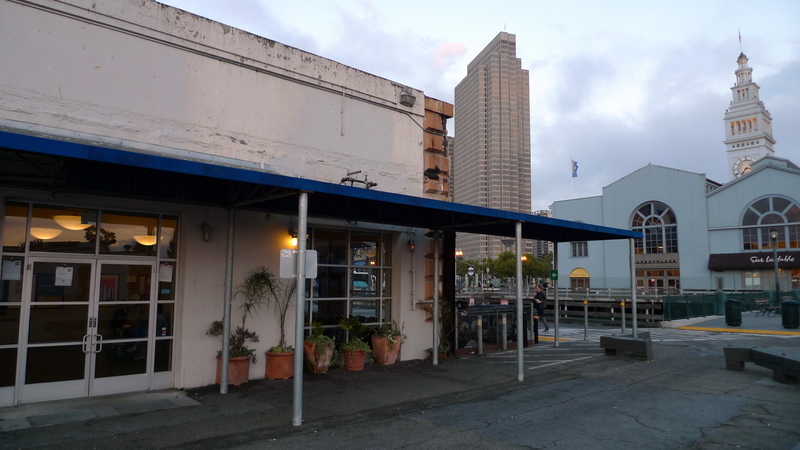 As you can see in the picture above, the Amtrak office (left) is not connected to the Ferry Building (right). Thankfully, I went to the Ferry Building the day before to make sure I knew where the Amtrak office was – a search that took about fifteen minutes. 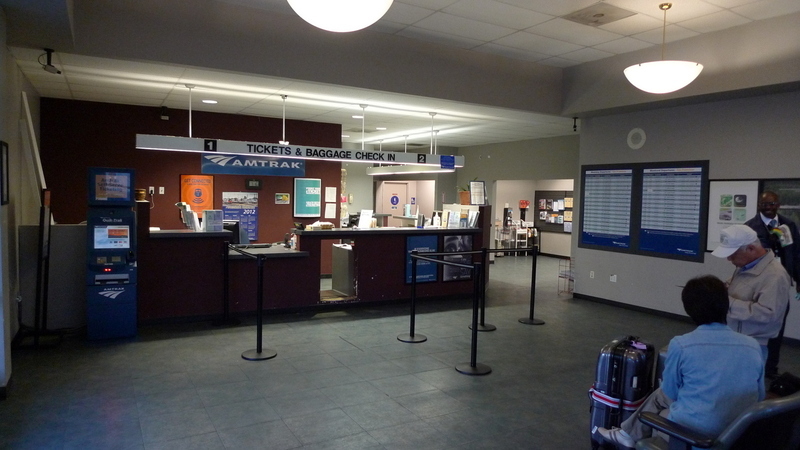 The inside of the Amtrak office is pretty plain, although reasonably clean. The staff was friendly and helpful, checking my bag all the way to Santa Barbara and explaining that I had about twenty minutes until the bus arrived if I wanted to walk to the Ferry Building for coffee. 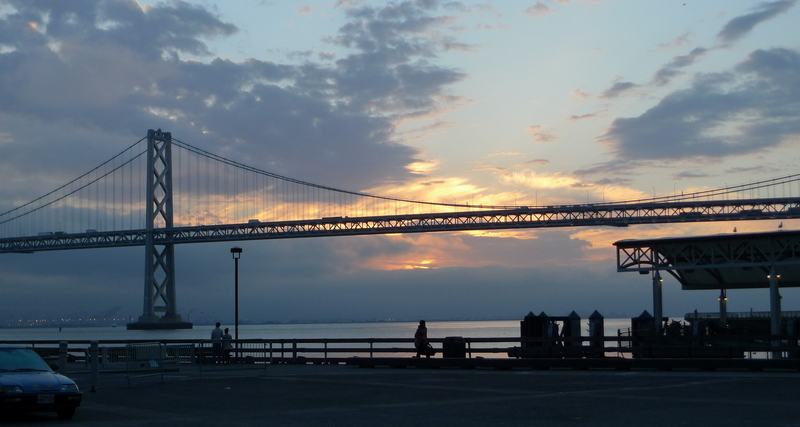 Gorgeous sunrise behind the San Francisco-Oakland Bay Bridge. One of the things I miss about living in San Francisco is the waterfront, which is one of the nicest features of the city. Right on time, the Amtrak bus arrived. The staff loaded checked bags onto the bus and the driver took half of our boarding passes (the same as on airplanes) for the San Francisco to Oakland portion of the trip. In the background you can see the Financial District. 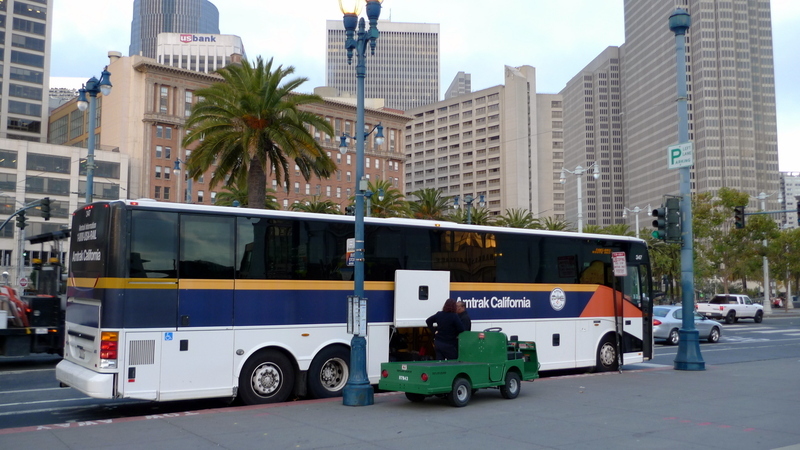 Only about ten passengers made the journey on the bus and the Ferry Building was its final stop in the city before heading to Oakland. We departed at 7:15, on schedule. 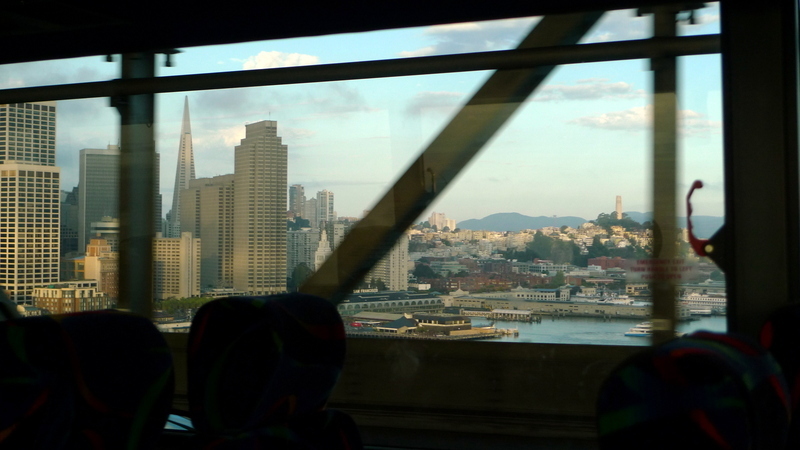 View of San Francisco, with the famous Transamerica Pyramid and Coit Tower. Bye, bye San Francisco! See you in a few days. The drive to Oakland took only about 25 minutes, although 40 was scheduled. At this time of the morning, the bus was traveling against the prevailing traffic, as evidenced by the long lines at the toll plaza on the westbound end of the bridge. 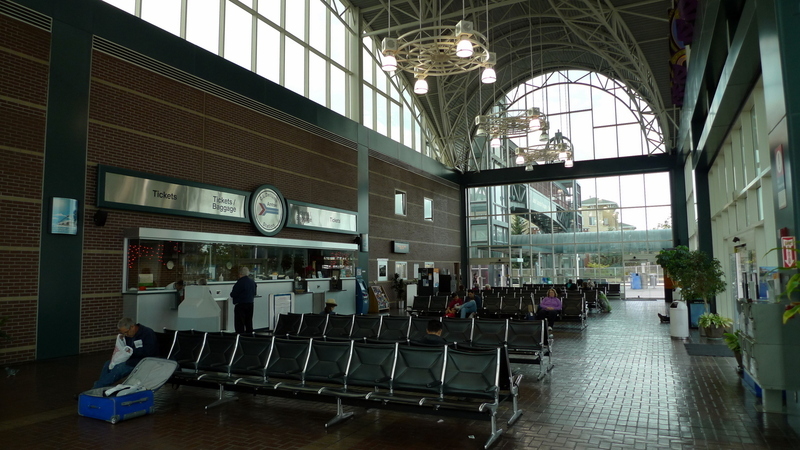 We arrived at the Oakland station, which is in Jack London Square. The station itself looks pretty new although it has a classic railway station aesthetic. While we waited for the train, which was scheduled to arrive about 8:00, a couple of Capital Corridor trains stopped on their way to San Jose. Our train arrived on time, leaving about twenty minutes for a crew change and for cleaning crews to service the train. I checked in with a conductor, who tore my boarding pass and then assigned me a seat. I asked to a window seat on the righthand side so I would face the ocean later in the day. We departed on time at 8:25. A view from my coach class seat. While the name is the same as on airplanes, you would recognize this more as a first class seat. The seating is two-by-two with wide seats and generous legroom. Later in the trip, I had a seat mate and the only complaint is that there is no armrest between the two seats. For strangers traveling next to each other, the American sense of personal space is lost. The conductor came through the train and put a seat assignment card over each seat. This way you could get up and move around, comfortable in the knowledge that your seat would still be free when you returned. Initially, I was apprehensive about leaving my bag unattended, but eventually decided that since we make so few stops, I would have a chance to spot anything that was missing before arriving at the next stop and inform a conductor. Yes, a little paranoid. Our progress down to San Jose was very slow, with the train crawling along at just a few miles an hour. 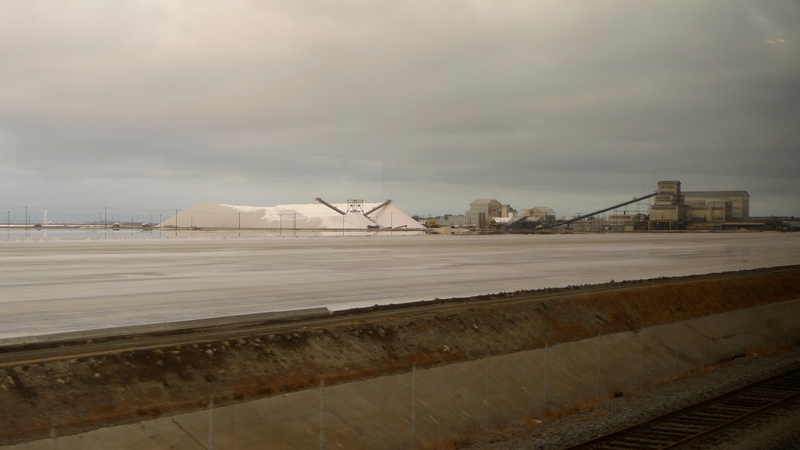 Here, a view of the salt evaporation ponds near Hayward. They were harvesting the salt before the autumn rains arrived and the view reminded me of those I’ve seen in Samut Songkhram province here in Thailand. 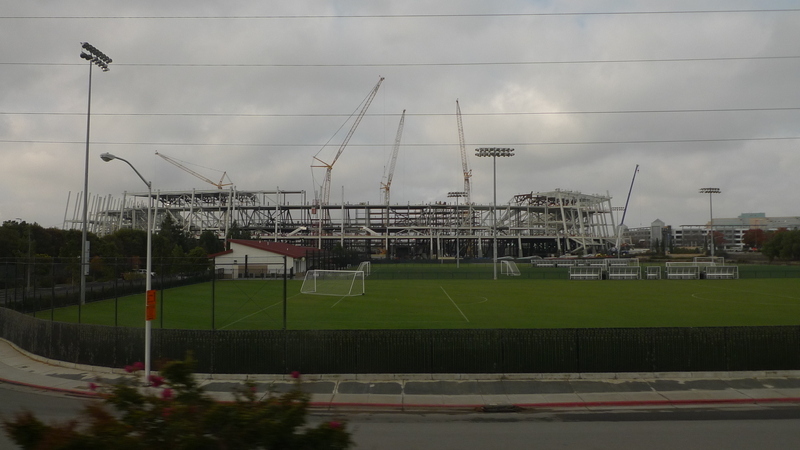 In Santa Clara, we passed the construction site for the San Francisco 49ers’ new stadium. It seems that even though they will play 40-some miles south of the city, they will maintain their name. Shouldn’t it be the Silicon Valley 49ers? Once we left San Jose, I went to the lounge car to take in the view and buy a bite of breakfast. 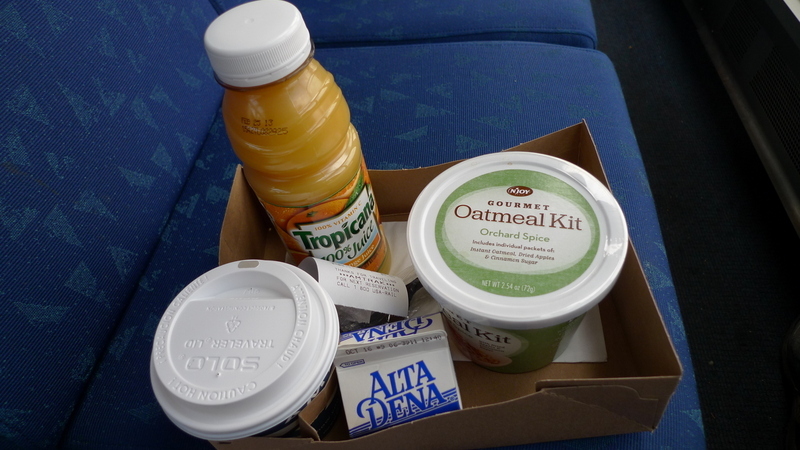 This “oatmeal kit” (which came with a cup of hot water and a container of milk) and an orange juice cost me only $5. The list of ingredients on the oatmeal package was shocking, though. Dried oats and a pinch of salt would seem to be enough, but they have all sorts of other things including dried apples and a cinnamon-sugar packet. The lounge car features tables and then sofa-type seats and swivel seats that face the windows. 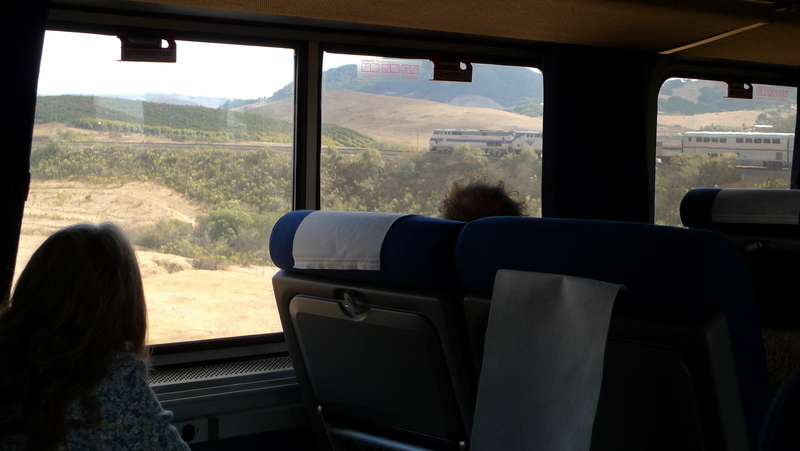 I should have spent more time here since the views are quite nice and the atmosphere is brighter than in the coach cars, but some of the passengers seemed to be escapees from the Greyhound bus. Sorry, that isn’t really fair to characterize people who travel on Greyhound in a negative light. What I should say is that there were several people traveling by themselves who were sitting in the lounge car, muttering to themselves (I checked – no bluetooth earpieces), and drinking beer at way too early in the morning. Instead of staying in the lounge car, I returned to my coach seat and took out my iPad. 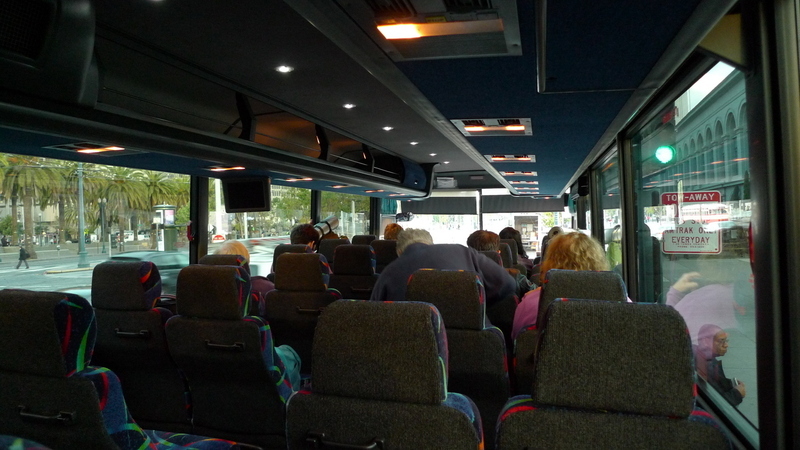 The coach seats include a handy electrical plug in the wall below the windows, so it is easy to use electronic gadgets without fear of running out of battery. View out the back of the train. There were many areas where we would slow to a crawl and several more times when we came to a complete stop to wait for a freight train to pass us. Amtrak doesn’t own its own tracks so they have a lower priority than the trains belonging to whatever railroad owns any particular stretch of tracks. According to the conductor, the fastest speed the train can go is 79 miles per hour (127 kph) and that is for a limited section of track. Compare this to the Taiwan high speed rail, which runs a top speed of 186 miles per hour (300 kph), and you have a pretty severe indictment of America’s railway infrastructure. Adding a second set of rails and upgrading tracks so more of the distance is rated for 79 miles per hour, would increase the average speed on the route from approximately 35 miles per hour to something more respectable. 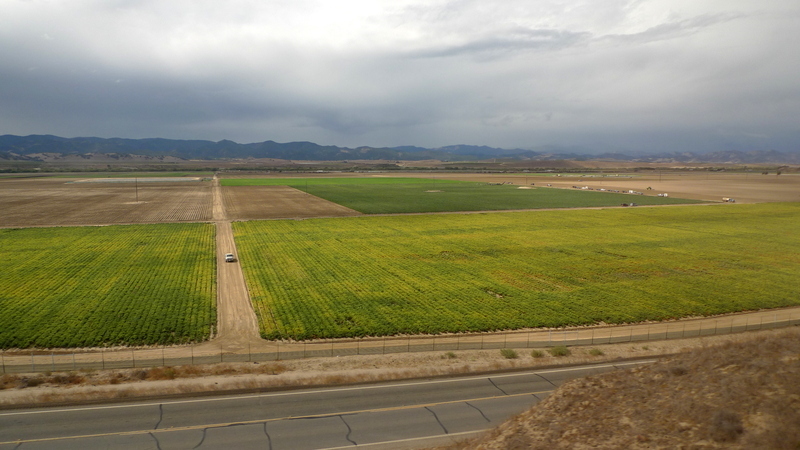 Passing through the Salinas Valley, all around were reminders that agriculture remains and important part of California’s economy. 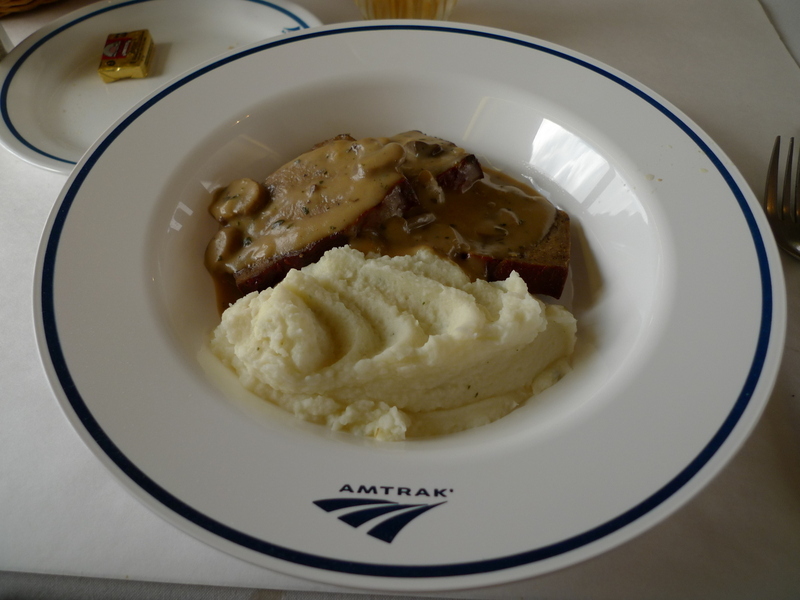 The conductor took reservations for lunch, which is served in the dining car. Reservations, which are in 15-minute increments, are taken to ensure that everyone who wants to eat, has an opportunity to do so. 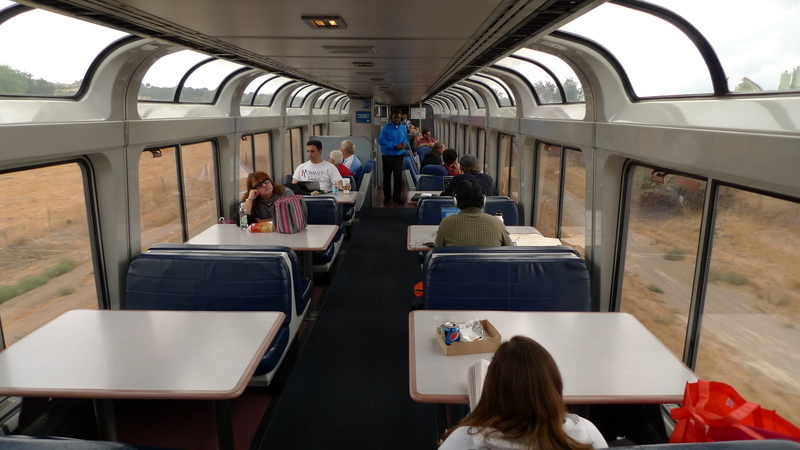 The dining car looks similar to the lounge car, with tables that seat four diners. If you are traveling in a group of less than four, you can expect to be seated with strangers. I was looking forward to this, as it seems that part of the adventure of train travel is to meet new people and have conversations with your fellow travelers. In this case, the three other solo travelers at my lunch table were resistant to my charms and every attempt at casual conversation was met with monosyllabic responses. As we ate in silence, everyone stared in a different direction to avoid eye contact. I could imagine the lines from our eyes looking like spotlights swooping across the sky but never connecting. The food on the train (southbound menu here) was uninspiring, although better than what you might get on an airplane. For $11.75, I had the “marketplace special” which this day was meatloaf and mashed potatoes. It was served with a sad looking salad, dinner roll, and coffee, tea, or milk. The texture was rubbery, although the mushroom sauce helped a bit. Not wanting to spend any longer than necessary with my unsociable dining companions, I skipped dessert and headed back to my seat. Heading into San Luis Obispo, we descended Cuesta Grade, losing 1,000 feet of elevation in just 11 miles. Here we see the train rounding one of two horseshoe curves, in which the front and rear of the train get a good look at each other. A few minutes later we passed the California Men’s Colony, a state penitentiary whose famous guests have included Dr. Timothy Leary and Ike Turner. 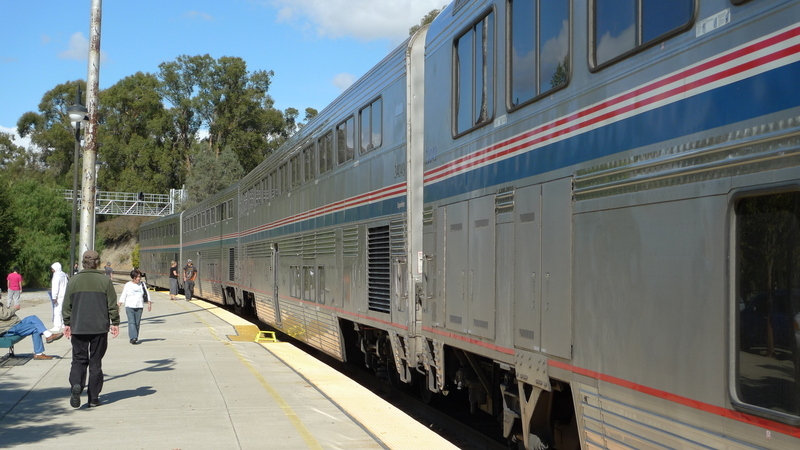 We arrived a few minutes early into San Luis Obispo and ended with almost thirty minutes at the station. I took the opportunity to get out and stretch my legs, climbing the pedestrian bridge to get some shots of the train. Smokers taking one of very few smoking breaks between Oakland and Los Angeles. There was a small portion of the city just across from the station, but no coffee shop – something I would have welcomed. Just a few minutes after departing San Luis Obispo, we stopped for more than twenty minutes to wait for traffic to pass, another example of the delays that seem incredible to me. Not long after we started moving again, we took a turn for the coast and caught our first view of the Pacific Ocean. 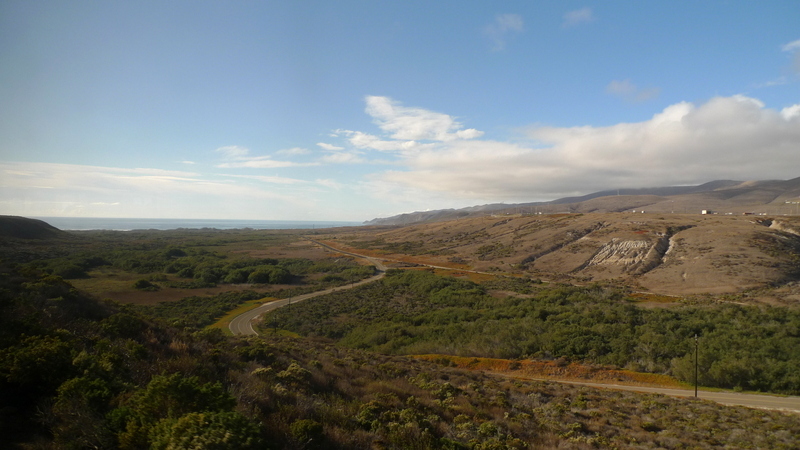 For the next 100 miles, the track follows the coast line passing Vandenberg Air Force Base and Point Conception. Beautiful view, turned slightly golden because of the window’s polarizing, of the Pacific Coast. At many stretches, we could view the oil derricks offshore in the Ellwood Oil Field. Interestingly, this was the site of one of only two attacks on the continental United States during World War II. In February 1942, Captain Nishino Kozo surfaced his submarine in the Santa Barbara Channel and fired 17 rounds from his 140mm deck gun towards the oil field. He inflicted little damage in the Bombardment of Ellwood but the attack and resulting hysteria were used to justify the internment of Japanese-American citizens, which began a week later. The train passes just a few dozen feet above the beach, a beautiful sight that made me thankful I had requested a seat on this side of the train. I arrived at the Santa Barbara station pretty much on time at about 6:00, nine-and-a-half hours after departing Oakland. My bag was delivered a few minutes later and my journey came to an end. Overall, the trip was comfortable and easy enough, although it is hard to justify spending so much time unless you are on vacation. Even with the hassles of modern-day air travel, I could have arrived in less than a third of the time for probably only about twice the price. If I was traveling with someone else, the train might be more enjoyable and I would some day like to take my nieces on the Denver to Salt Lake City trip that I took as a child. Until then, I think all of my travel in the US will be by air. This entry was posted in Uncategorized and tagged Amtrak, Coast, Oakland, SantaBarbara, Starlight, train, Trains, transit, travel by christao408. Bookmark the permalink. Thanks for sharing. As a travel enthusiast I feel like I have a much better idea of train travel after reading this. Great pictures too! beautiful photos! If I ever get to the States, I want to take the same route like you. I just love travelling on trains. Thank God that you got the window seat. In Myanmar, travelling by train is not that great like on Amtraks because the facilities aren’t upgraded. Plus it’s quite slow. But it’s still quite an experience.The meatloaf and mash potatoes reminded me of my junior high’s (while I was living in the States) school lunch (which I always gave away to others to eat :D) I especially love the beach photo! I’m not certain what that Denver/Salt Lake City trip would be like today…interesting to experience it again. I think the girls would enjoy it, especially the part through the mountains, but in a few years. Utah was pretty barren as I recall, not much to see. I’d like to take the train from Chicago to San Fran or Seattle some day. We’ve had friends do that and they say it’s quite interesting. The emphasis in US is freight use, not passenger use. If the emphasis were reversed, the infrastructure would be different. We would like to go back to Santa Barbara some day. We were married there, and then we lived in San Luis Obispo as my husband was in school at Cal Poly. I well remember the Cuesta Grade. In those days cars overheated easily, and we would often see cars stopped alongside the road where there was a little water, putting water in their radiators. Fortunately we didn’t have that problem with our car (a Mercury his parents had given us.) When we do go, we’ll probably fly into San Francisco, and then? it must be wondeful to travel i never get out to travel much.nice post. About 10 years ago, some friends took the train across country — they said never again! 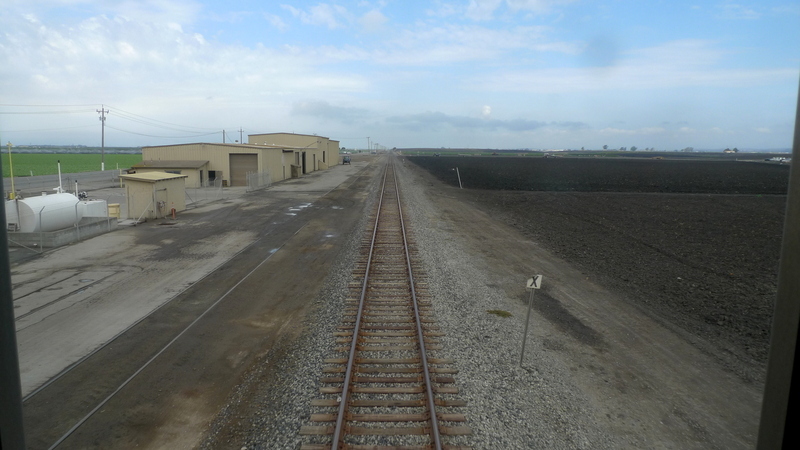 There is movement towards a high speed rail line from SF to LA — it’s been voted in, but they are beginning on a stretch from Modesto to Fresno, out in the valley with endings where nobody will ride it — if they do part 1 and never finish, it will be a complete waste! Funny that you should compare it to Greyhound — as I read the first part I was thinking it looked a bit like a Greyhound ride! In Sta Barbara, they have moved the Greyhound terminal to the train station — the interface will be easier that way. It does look as if you had some beautiful views, particularly on the last 1/3 of the ride! The book on the Japanese attack via submarine was not that detailed but thanks for the mention. I do prefer to travel with someone if spending that much time. And again if sightseeing. But I would stick to flying if alone. You got some great shots for sure. Avoid the food lol. 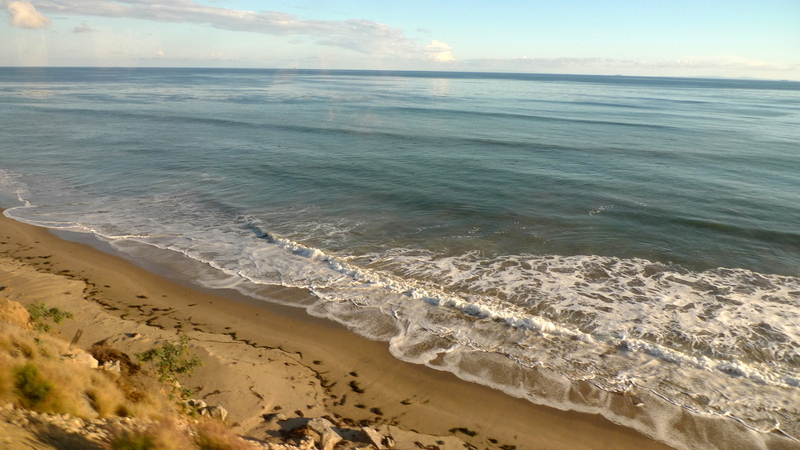 i’ve caught the surfliner between los angels and san diego a couple of times, and i estimated that it takes almost the same amount of time as driving there. my former boss loved to take the train everywhere rather than fly (which made for very annoying 2-3 day periods where he was out of contact when he was heading across the country). i wish the us had better and faster rail lines! I am sorry that the companions at lunch time were such dorks. How could they not warm up to you? I am glad you got that train ride under your belt Chris. I think I would like it. Have a book or two to read and just watch the scenery. I also would have loved the view of the ocean. Do they allow you to take your own food on the train? like sandwiches or samosas etc? Whenever I travel, under all circumstances I NEVER leave my bag unattended. If I have checked luggage (under the bus or something) then it’s okay because it’s locked behind a door. BUt my backpack or carry-on is NEVER out of my sight, no matter what. When I was in Seoul for a week’s vacation, I would carry the 20kg backpack with me to the bathroom at bus stops or from cafe’s. I am so horribly paranoid about theft! Dang, your lounge car was way nicer than the one on the Crescent. I’ve taken that a few times from Philly to Atlanta to visit the boyfriend and it didn’t have windows up top. Plus most of that trip is at night unless you’re going from Atlanta to New Orleans so the view out the windows is generally blackness. It is nice to not be molested by the TSA, though. Despite the length I prefer the train. @baldmike2004 – @ItsWhatEyeKnow – Thanks to both of you for your recommendations! 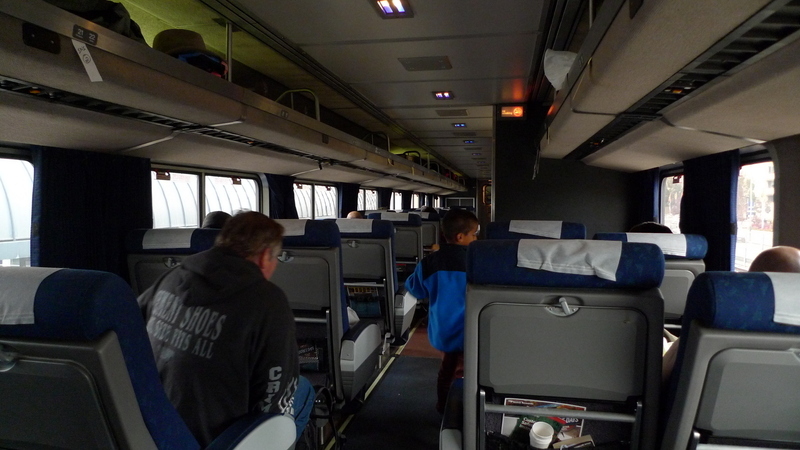 @carolinavenger – If I recall correctly, Amtrak recently did a lot of refurbishment of the Coast Starlight as part of an effort to improve the line’s appeal to travelers. Sounds like the Crescent needs to be next on their list. @secade – Well, I feel that way when I’m in public but I guess on a train that is going for more than an hour between stops, it seemed pretty safe to step away from it for a few minutes. I noticed, for example, that nobody in the dining car was lugging backpacks, briefcases, etc. with them. @ZSA_MD – You are welcome to bring your own food – no alcohol, though – and I imagine that some of your samosas would be the perfect treat for such a journey! @kunhuo42 – For shorter routes, the train is pretty competitive. I took it several times from the Bay Area up to Sacramento and also once between New York and Philly and both times it was much easier than driving or taking a flight. @Fatcat723 – Yes, a companion is best for a long journey. @PPhilip – Book? @slmret – The whole high speed rail debacle in CA frustrates me. That the state would benefit from high speed rail is clear but the way they are going about it ensures that it will be incredibly expensive and potentially never finished. @gleerockerchic83 – I consider myself very blessed to be able to travel fairly often. Not having children sure makes that easier! 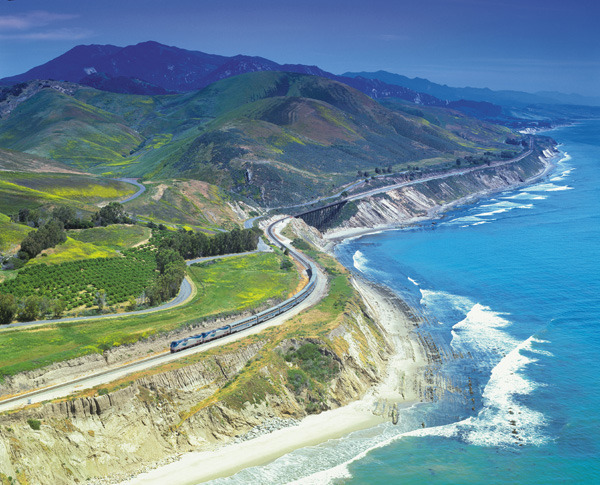 @ata_grandma – I remember traveling with my friend in college – he went to Cal Poly San Luis Obispo – and overheating on the Cuesta Grade was a first-hand experience! @jandsschultz – Will have to plan to take that trip with the girls in a few years, then. Autumn. @dawn_1o9 – I remember reading a blog site about train travel in Myanmar. Even here in Thailand, it is definitely a “rougher” way to travel than on Amtrak! Thanks for stopping by and commenting. @murisopsis – I guess the regional routes aren’t as nice as the longer-distance trains? Now that was quite an adventure even though the food didn”t look to inviting. My grand daughter and I are planning a train trip for a few days when summer break is here for her school.I am saving up my respite time so hubbys fav care giver can spend the two days with him.After seeing the view you had on your adventure I am looking forward to spending an adventure by train with my yougnesy grand daughter, Vanna, who is 15. I like train travel and wish we had high speed trains here in the Ontario to Quebec corridor. The train ride from Toronto to Montreal or Ottawa is about 5 hours. It’s a bit shorter if you’re on the express. The view is nice especially in the fall and you do get to see backyards, farmlands & various small towns along the way. I do want to go across Canada (about 3 days Toronto to Vancouver) again. Those people that mutter to themselves and drink beer that early in the morning is a bit unsettling. It’s unfortunate and I wonder if they are victims of the brutal recession. @Grannys_Place – I think a train trip might actually be quite a good adventure for a pair of intergenerational travelers! @ElusiveWords – I’d like to try the Rocky Mountaineer, actually. Will skip on the flatlands section of the rail line, though, and just fly to TO. As for the mutterers, I suspect that they have faced some tough times whether from the recession, PTSD from military service, or something else. Never hurts to remember that and have some compassion for them.